This year, the International Volunteer Day celebrates the special contribution of volunteers in building resilient communities worldwide. Globally, more than 1 billion volunteers with equivalent workforce of 109 million people are on the front line, contributing to the efforts made to face natural disasters, economic stresses and political shocks. 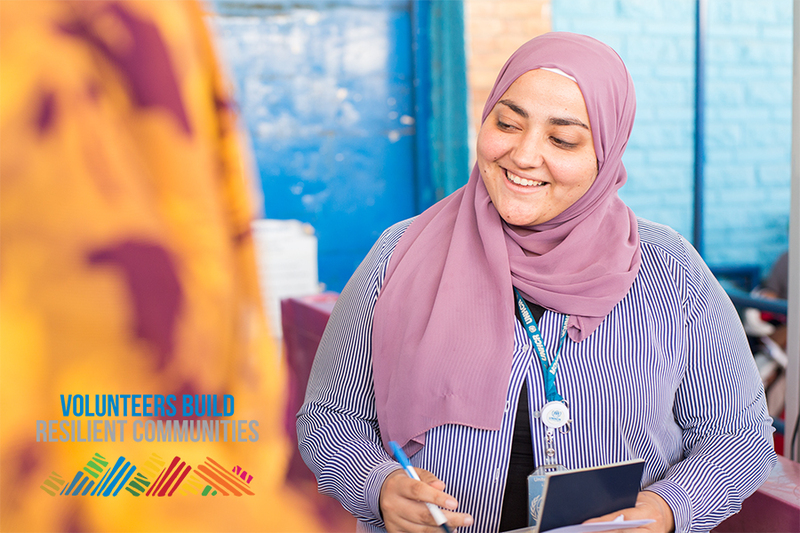 Hend Ahmed (left), national UN Volunteer Community Service Assistant, and Marwa Ghareeb, national UN Volunteer Registration Assistant, serve with the UN Refugee Agency (UNHCR) in Cairo, Egypt. Hend and Marwa support people of concern at a UNHCR reception centre in 6th of October City in Cairo. In a such situation, the role of volunteers in strengthening resilience is emphasized, according to the State of the World’s Volunteerism Report 2018. This is because of the distinctive ability of volunteers to support the integration of refugees and displaced people into communities, building people’s ownership of peace and development processes and strengthening social cohesion within and across groups. For example, volunteers have been on the ground in Yemen – which is experiencing the most drastic humanitarian crisis in the world with as many as 22 million people in need for humanitarian aid, conducting food security needs assessments, and preparing and distributing food assistance vouchers. Similarly, volunteers are providing medical support to displaced populations in Jordan, and building back the Mosul Governorate in Iraq, through reconstruction projects. Recognition of the role played by volunteers in building resilient communities in – and despite – this turbulent context marked the IVD 2018 celebrations in the Arab States. Volunteers from the region marked the day by sharing their stories online, posting photos and videos about their experiences and explaining how their work and volunteerism in general contribute to building resilient communities. Volunteers build resilient communities by being first responders to a crisis, working with the most marginalized groups in the community, and coming together with other volunteers to make the world a better place. –Rayan Ezzeddine, a national UN Volunteer Youth Advocate serving with UNICEF, Lebanon. Several on-site events are bein held to celebrate IVD in Egypt, Iraq, Jordan, Lebanon, Palestine, Somalia, Sudan, Tunisia and Yemen. Interestingly, volunteers in countries facing ongoing crises engaged actively in IVD celebrations. For example, Sudan witnessed several events in celebration of IVD 2018 by UN Volunteers serving with UN missions in Darfur and Abyei. Experiences of volunteers and their role in building resilience were showcased in a special event in Khartoum. In Somalia, UN Volunteers and different UN entities and volunteer-involving organizations came together in UN Camp in Mogadishu to discuss how volunteerism can strengthen resilience among local communities, displaced persons and in situations of fragility. A similar discussion took place in Iraq, as UNV, UN partners and volunteer-involving organizations gathered in Erbil to exchange ideas about how volunteers can be a source of addressing challenges related to community resilience. In Egypt, IVD 2018 celebrations by UN Volunteers and UN partners aimed to mainstream volunteerism among migrants, people with disabilities, youth and women. This aim is namely relevant to this year’s theme, since inclusion of vulnerable groups in different ways contributes to the community’s resilience. Experiences of migrant, disabled, and female volunteers were shared, with emphasis on the role of volunteers in addressing challenges facing local communities. In the State of Palestine, UNV is partnering with UNDP, the Government and the private sector to launch a national campaign for promoting volunteerism, as a means of addressing national challenges and building resilience in an environment where it is much needed. On this day, special thanks go to every volunteer around the world, for their contributions to preparing communities for what comes and weaving the safety nets societies need.